Qlockwork Pro 2.1 - Download Win Apps. Pro version of the Qlockwork time tracking add-in for Outlook. QP is a premium version of the Qlockwork time tracking add-in for Outlook. 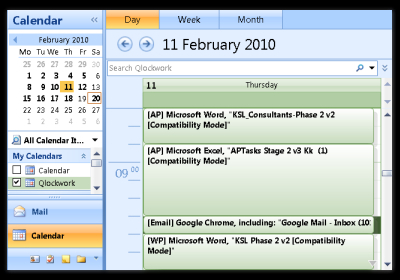 QP talks directly to Windows to automatically provide detailed data about how all computer time is spent. It is designed to track all PC activity without the requirement to start and stop timers. QP adds scheduled reporting, Outlook calendar integration and a choice of tracking options to the basic Qlockwork product. In comparison to Qlockwork Pro is the next step in MS Outlook Synchronization. It delivers industry strength for lightning fast and robust synchronization of large Outlook files between two or more computers. Supports synchronization with MS Exchange Server.